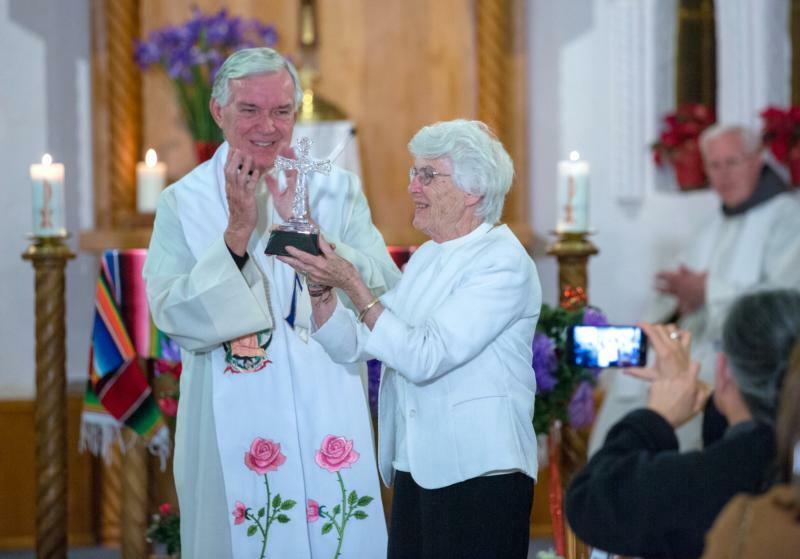 LAS CRUCES, N.M. (CNS) — Sister Marie-Paule Willem received the Catholic Extension’s 2018-2019 Lumen Christi Award for her lifetime of missionary work during a celebration Dec. 12 at San Jose Mission Church in Las Cruces. The 85-year-old Franciscan Missionary of Mary has been serving the poor in the United States and around the world for more than 60 years. She is currently in ministry in the Las Cruces Diocese, where she serves women in detention and is pastoral administrator of San Jose Mission, a growing parish community along the U.S.-Mexico border. The Lumen Christi Award is the highest honor bestowed by the Chicago-based Catholic Extension, a national organization that raises and distributes funds to support U.S. mission dioceses, many of which are rural, cover a large geographic area, and have limited personnel and pastoral resources. During the community-wide Mass and celebration at San Jose, Father Jack Wall, president of Catholic Extension, commented during the homily how moving it was to be with Sister Willem and her parishioners. Nominated by her bishop, Sister Willem was one of 47 nominees this year and one of eight finalists. As the Lumen Christi recipient, Sister Willem and the Las Cruces Diocese will share in a $50,000 grant. Growing up in Belgium, Sister Willem survived Nazi occupation. She was also expelled from South America while advocating for social justice amid a brutal regime. Sister Willem, who speaks five languages, arrived in the Rio Grande Valley in 1980 to minister in the border town of Roma, Texas, which is in the Brownsville Diocese. She became the director of religious education for the Our Lady of Refuge Parish and worked with incarcerated women at a detention center. She then moved to the Diocese of Las Cruces to serve migrant farmworkers and immigrants. Five years ago, she became pastoral administrator at San Jose Mission Church in Dona Ana County. When she arrived, the parish only had a handful of parishioners and no full-time pastor. She started building up the church and the community. Today, the parish has more than 200 active families.